My favorite time of the year is almost here! Summertime! We just booked our annual trip to the beach house for some much needed rest and relaxation. Not everyone can escape to the beach, so one solution is to bring a bit of the beach to you! Today I’m sharing how to Create a Seaside Retreat in your own home with a little help from Kirklands, plus I have a gift card to giveaway also! 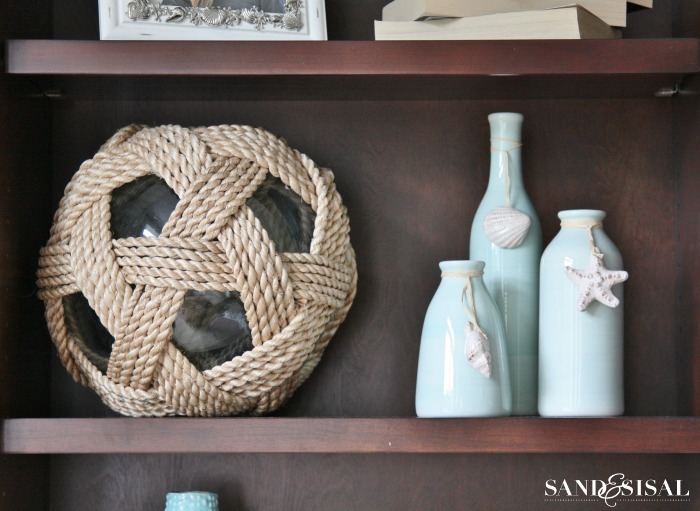 If you have followed Sand & Sisal over the past several years then you know that I like a more subtle, “transitional coastal” decorating style on the main level of my home vs. a stronger, more festive vacation beach house style. My exceptions are in the playroom and my younger kids rooms. Last year I shared a post full of coastal decorating tips: How to Decorate Coastal (without lookin’ all Margaritaville). Feel free to check it out. To give my family room a bit of a summer refresh, I headed to Kirklands and found so many beautiful items. They have a huge Seaside Retreat collection this year, ranging from classy coastal chic to cute beach house decor. 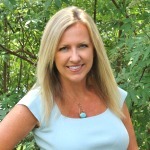 I picked up a few of their throw pillows for the sectional, a soft aqua metallic sailboat pillow and…. 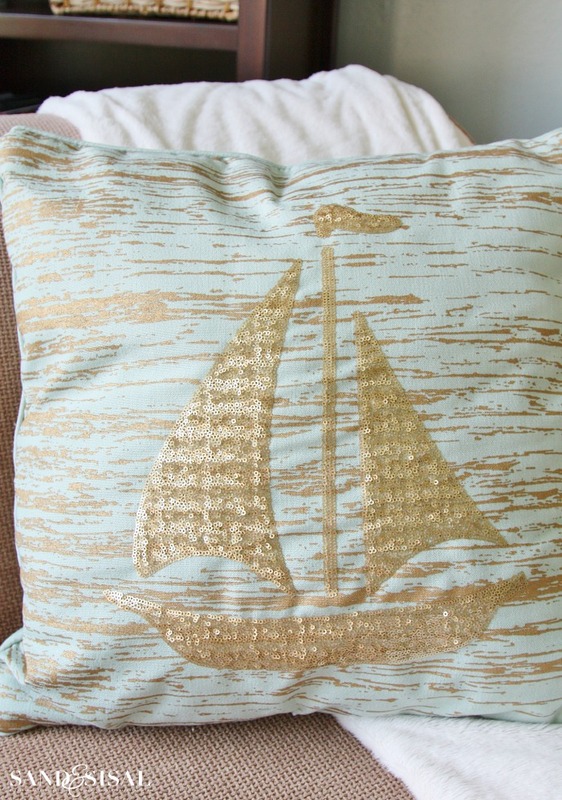 this metallic anchor pillow, detailed with thousands of tiny sequins and a gold metallic painted background. I wish the camera would show how much they shimmer in the sunlight! When decorating bookshelves, I like to keep the color scheme very limited, which helps to create a cohesive look and prevents the bookshelves from looking cluttered. This color scheme of pale turquoise, sandy tan and white work well against the darker mahogany backdrop. 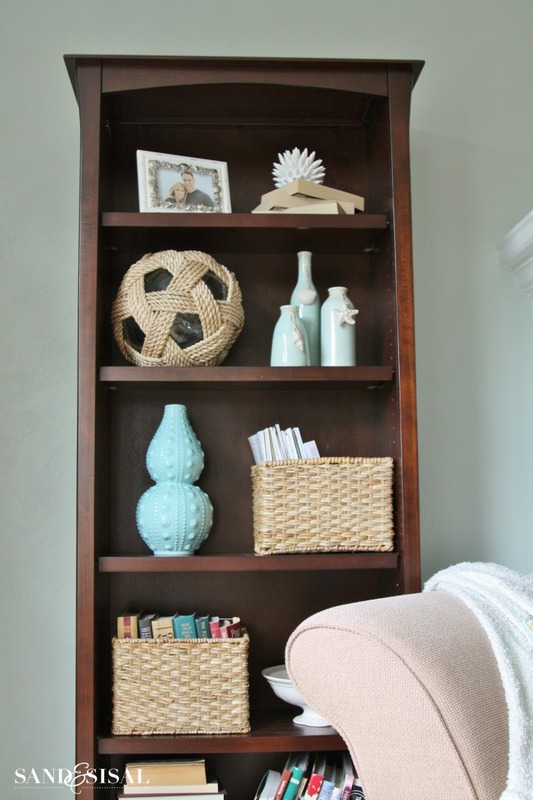 Mixing in varying textures and finishes adds to the overall interest of the bookcases. This pretty turquoise sea urchin ceramic vase begs to be touched! 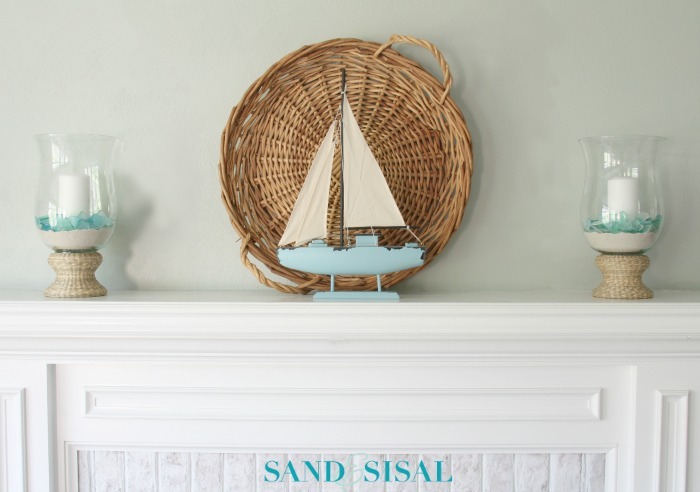 I kept the coastal mantel simple this season with two natural rattan and glass hurricanes and a cute little sailboat statue. Using lots of natural materials like rattan, seagrass, sisal, wood, etc. is important if you want to achieve a relaxed coastal appearance. To dress the hurricanes up a bit, I filled them with some clean white pool sand and then surrounded the candles with a bag of sea glass. Aren’t they lovely? For a final touch to the coastal family room, I added a tray to the coffee table that has this amazing canoe shaped, carved wood bowl. It is carved from one piece of wood! Colorful glass floats are displayed inside and next to it is some faux coral and a fabulous seaglass blue hurricane with rope handle. Dim the lights, sit back, relax and let the candlelight glow! 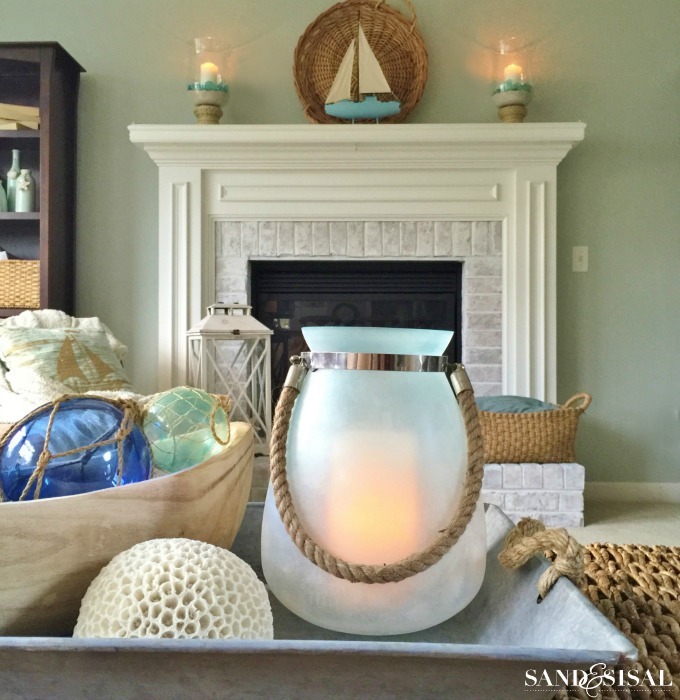 I hope you enjoyed seeing a few ways how to create a seaside retreat in your home! Disclaimer: This post has been brought to you by Kirklands. All expressed opinions are my own. looks perfectly beachy to me! we are also looking forward to some beach time this summer. Your beachy decor is beautiful! 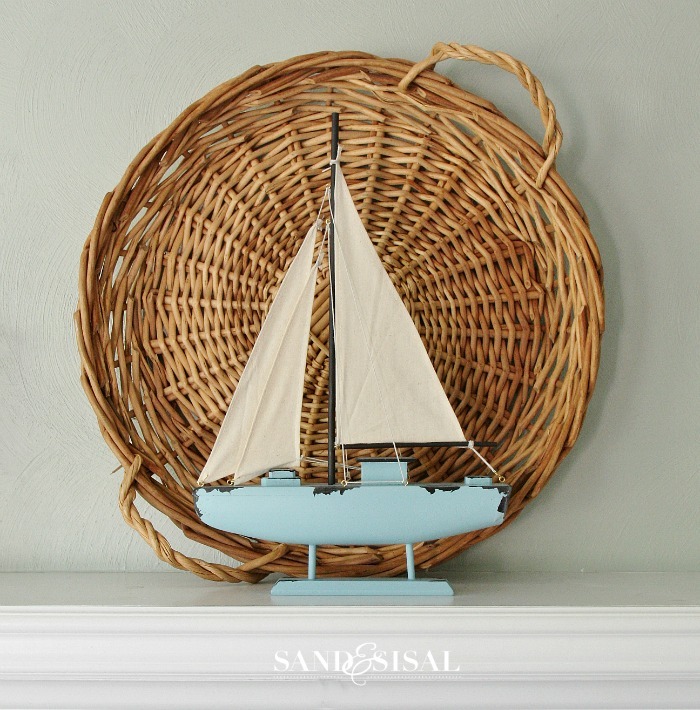 My favorite is the sailboat on your mantel from Kirklands – they have a lot of cool coastal decor on their website, & the sailboat wins! I love this Distressed Coffee Bean Framed Mirror. It would go beautifully in several places in my home, and I love the way mirrors take the light from windows across the room. I am in the process of changing our FL home to a more coastal feel. I like the subtle look too…not in your face beachy! I love Kirklands and a gift card would really come in handy. Thanks for the give away. Lovely home with a beachy-keen atmosphere…just what I desire to duplicate! The gift card will certainly help my quest! Love the room and all the ideas! Wow! I had no idea that Kirkland’s has such great stuff!! From home decor to curtains and rugs, I spent an hour on their site adding items to my cart! Going by their store TODAY! Love your new Kirkland’s goodies that you got! Wanna come style my house? 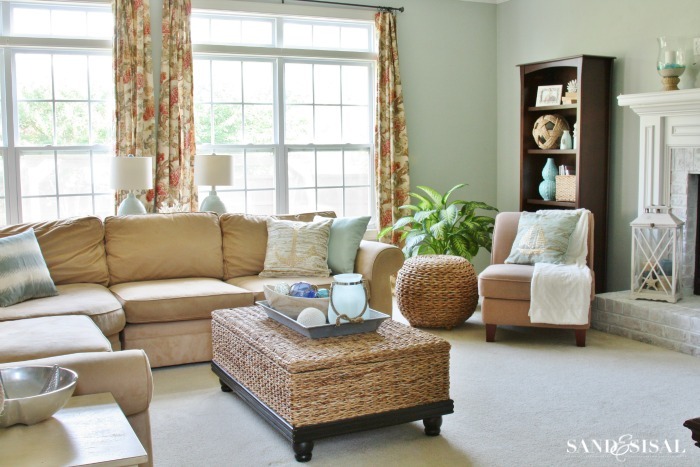 I absolutely love these soft colors in this room! I adore the Metalic Anchor Pillow. I live out in the country in FL so I’ll have to look up where there’s a Kirklands and go check out all the fun and beautiful beach u items they have in there new collection. I love the metallic golden arrows pillow. Would be perfect for my nursery that I’m designing. I also love the metallic seahorse pilloe that you chose! I would love some of new those coastal pillows! Love the oatmeal tufted headboard! I love your beachy vibe in your home. It is what I’m trying to replicate in mine. I really like the rattan elements. I love your blog and I love anything with a beach theme. Love the hurricanes. 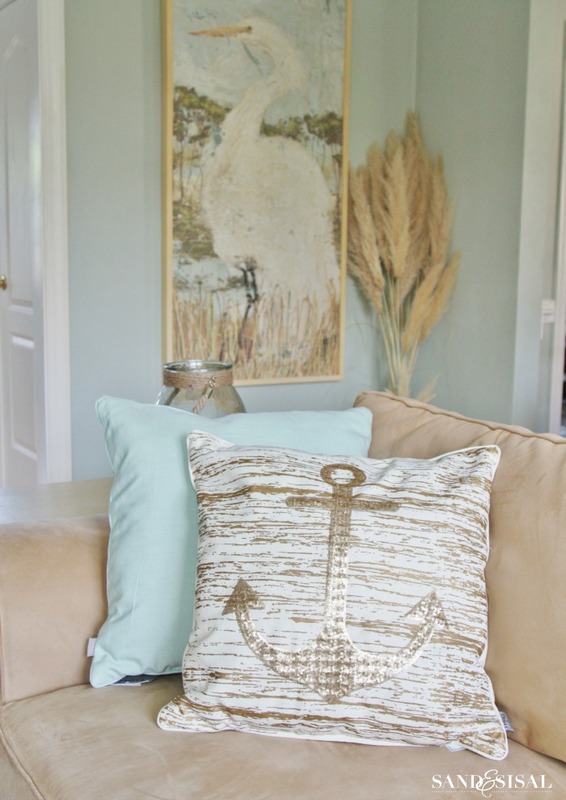 I absolutely love that anchor pillow!!! I always feel transported to the beach when you show your home. LOVE!!! I am in love with the natural rattan glass hurricanes from Kirklands! Love your coastal beach home! 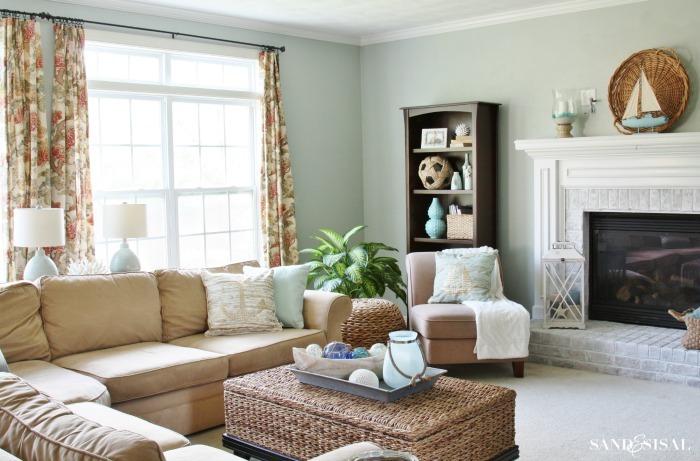 Love your classic coastal theme living room. I like the Whitewash Knotted Framed Mirror. I do too! Isn’t it pretty? I wanted to buy it but all the stores in our area were sold out. I’ll have to try online. Wow, it’s been awhile since I have been to Kirklands website. I fell in love with all they’re glass vases. Need some of those. I love your style! My husband and I moved from sunny Florida to Germany last year because of the military. We love it here but we miss our home state and the beautiful beaches. My favorite items in the Kirkland’s seaside retreat collection are the cream coral table lamps and coral candle votives. Adore this room!! Thanks for the daily dose of inspiration!! Love Love Love. WE are ready for the summer and our bi-annual trip to the beach. I love the Natural Seagrass Basket Stools & on their Facebook page the Red, White & Blue Ribbon Wreath!!! Great Ideas.. !! They have so many cute things right now, I’m in love with the Aqua Plaid Picnic Tote. Love the relaxing beach look! I am delighted and inspired by your style and use of Kirklands décor items! 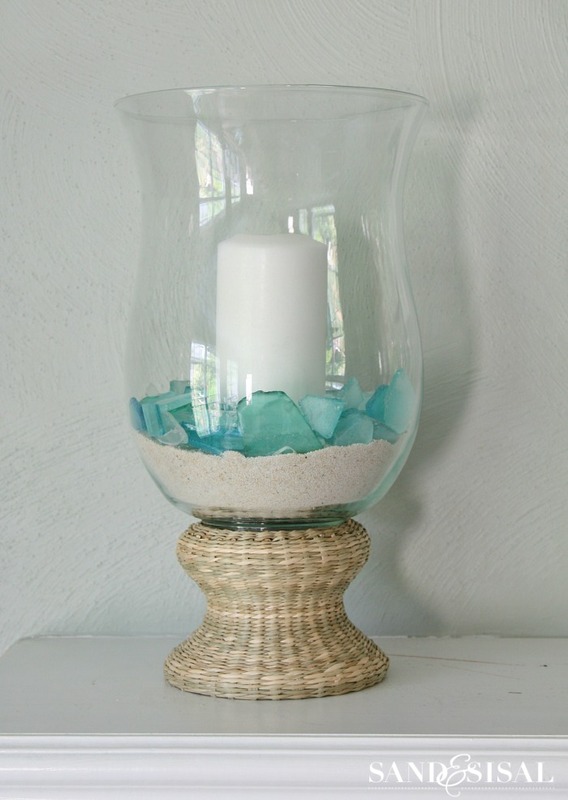 Love the hurricane candle and the use of sand and sea glass! Kirklands has so many things I’d love to have! One of my favorites in the Turino Turquoise Ceramic Pitcher. I am adding that color to my kitchen and it would be perfect. I really like those mirrored chests that are one the website…plus they are currently on sale! A decorator that I had come in to give me advice on my bedroom suggested having chests like those on either side of our bed but most of them that I have found are WAAAAY out my budget but not the ones from Kirklands! They had lots of other fun inexpensive items to add summer fun to my home too. I would love to win the gift card. Love all of Kirkland’s coastal items. My house is decorated in this style even though I am miles away from the beach. I just put the turquoise sand dollar door mat out on my porch last weekend, and I’m thisclose to buying the sand dollar burlap pillow. I have been hunting for a large living room wall clock for almost a year. I really like the sleekness of the Addison Cream Open Face Clock. I love the new retro chairs Kirkland has! I LOVE the seahorse accent pillow! I too love anything to do with the beach! I love Kirkland’s Dreams of Water framed print….it’s definitely my happy place! Thanks for the giveaway! 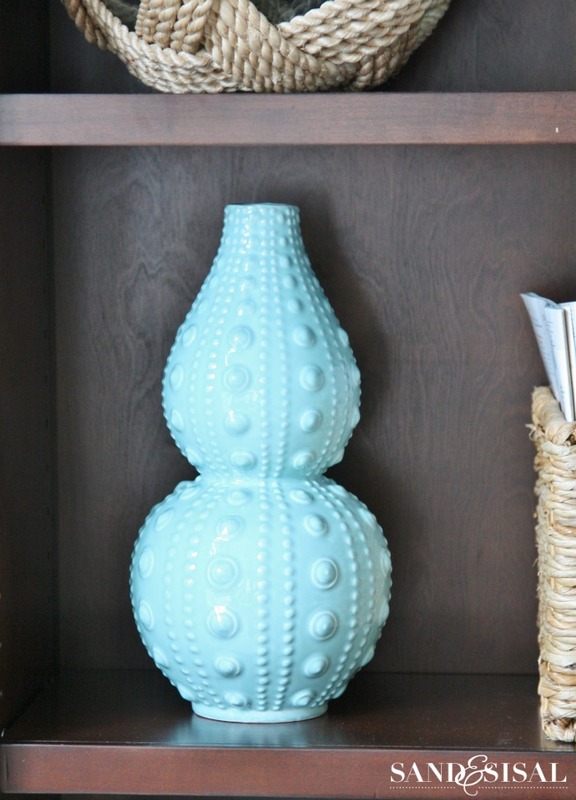 I’m absolutely loving the Turquoise Sea Urchin Ceramic Vase!! I like the Turquoise Retro Metal Bench. Very pretty. I liked your tip on the bookshelf. I like the Seashell Shadowboxes. They would look great on the wall in my guest bathroom. I like Libby Silver Mirrored 3-Drawer Chest. I was just at Kirkland’s shopping with a friend to spruce up her place but saw many things I’d love to incorporate into my own! Love that store! Tufted sofa or tufted anything for that matter!! I love the Jute-Wrapped Nautical String Lights. They would look awesome hanging under the canopy on my back deck!! I love the whole seaside collection! The hurricane lantern is my favorite. I love the woodtone floor lamp. I love using natural elements in my decorating. I wish driftwood was easy to come by here in PA. That would mean the beach was near. I would love to purchase a pair of pre-Lit Boxwood Spiral Topiaries. A $50.00 gift card would be a great help. I love almost all of the furniture at kirklands! Love the softness of the room and the light tourqoise …just beautiful ..perfect for my mother in la. She has those some big window ..must share!! Oops I forgot love the white lantern on the fireplace…love Kirkland !! We don’t have one in our state WA. We need a store!!! I have been pining after the Metal Rope Wall Mirror for some time now. I love it and it would look terrific in my office. Thanks for the giveaway! I’m re-decorating my basement in this type of them to bring a little east coast to our Midwest home. That sailboat statue would be perfect! I love your decor style! The way you pick complimentary pieces and expertly place them around the room to tie the theme together is certainly inspiring me to do a little redecorating of my own! Kirkland’s is certainly on my list of places to shop and I am really crushing on the large sundial mirror! It’s beautiful! Thanks for the post! LOVE the coastal beachy look! Kirkland’s certainly does have a nice variety of items right now. I’m thinking a refresh is in my future! I absolutely love their Blue and Green Mosiac Gazing Ball. There are so many things to choose from, especially since our loft is done in a coastal theme, but I really like the Coastal Cranes Wall Plaque. I love the Whitewash Knotted Framed Mirror,thanks for the chance! I absolutely love Kirklands! It’s one of my favorite places to shop. I live in Florida, so I too love the coastal style. Your living room is gorgeous. I love the white lantern on your fireplace. Thank you for the giveaway! I’m so ready for a change, and this is exactly the direction I want to go. Thanks for a beautiful inspiration! I love the metal tray with the canoe and floats inside. Very coastal without being over the top. Thanks so much for letting us see your adorable home! Item #: 121470! Gonna get it tonight. The Sea Urchin Vase! And you’ve managed the perfect balance! I like the metallics in bloom mirror. The Chatham Blue Scrollwork Scatter Rug is very pretty. My preferred beach style is much like yours. I’ll have to make a trip to my local Kirkland’s and check out what’s available. Just the right look of beachy without going overboard. The textures and colors make all the difference. Love the hurricanes with the sea glass inside! Immuna need that turquoise sea urchin vase! I would like the Clear Glass Lantern, 10.5 in..
i love the libby mirrored chest! I am in love with the yellow chevron rug. I love any lantern and anything coastal! I especially love the Coastal Driftwood Framed Mirror! Thanks for the giveaway! So pretty! Love all the turquoise and wicker! Love the beach style! it’s the theme in most of my house. The sailboat would match one I have! love, love, love Kirklands! I like the Ava Black Arch Wall Mirror. Makes me want to stick my toes in the sand and watch the dance on the waves! I love the Panama Espresso Bonded Leather Arm Chair! I love how you created the beach at your home. I could buy everything at Kirklands. I especially love the blue vase! I’d get the Aqua Pyramid Lantern. Lots of beautiful things. You home looks great! Love the Distressed Red Open-Face Clock, 39.5 in.! oooh! 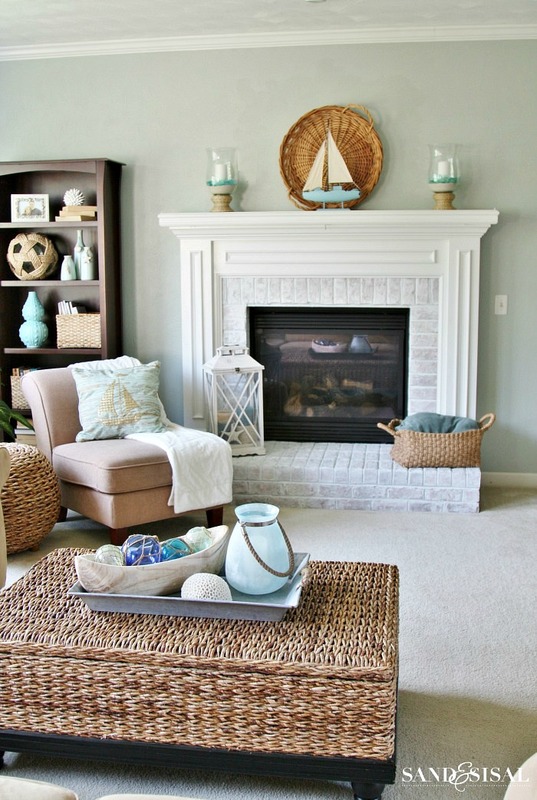 this post is just in time for our beachy living room makeover! I like the home sweet home burlap pillow and the grand old flag pillow. I like the canvas art at Kirkland’s. I have bought several for my home. 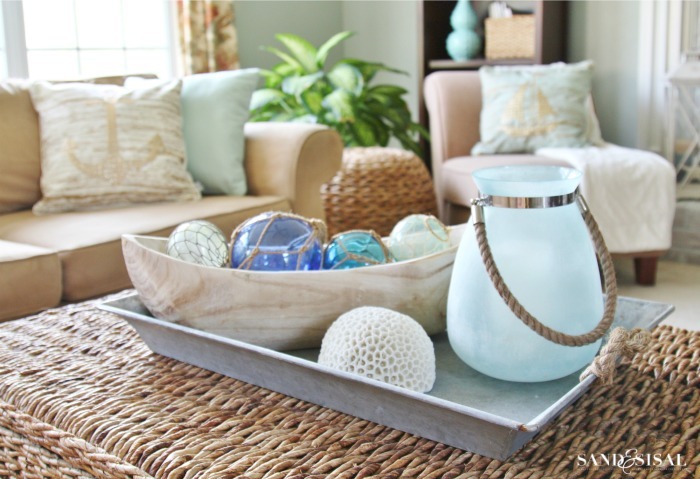 Love the pillows and the sea glass hurricane. I love all of their stuff. The Rustic Turquoise Picture Frames would be so cute on my mantle! Hey Kim! We have a customer that would LOVE to know the color you used on your living room walls. Any chance you remember your paint color? It effortlessly screams relaxations. Love it. Hi Haley! Sure thing, the wall color is Comfort Gray by Sherwin Williams. Thanks for checking Kim. I really appreciate it! Love this! Could you tell me the name of the wall color and who it’s by? Thanks! Thanks Jessica! The wall color is Comfort Gray by Sherwin Williams.